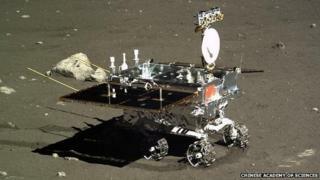 China's first lunar rover could potentially be saved, despite experiencing mechanical problems, state media report. The moon rover had "awoken" from its scheduled dormancy and "stands a chance of being saved", a spokesperson quoted by news agency Xinhua said. The Jade Rabbit suffered a serious mechanical problem in January. Its deployment on 15 December was the first successful landing on the Moon since 1976. The lunar rover was expected to operate for about three months. Earlier reports in Chinese media had suggested that Jade Rabbit, or Yutu in Chinese, had been declared dead on the surface of the moon. In a report entitled "loss of lunar rover", the China News Service said that the rover "could not be restored to full function on Monday as expected" and was "mourned" by Chinese social media users. However, Xinhua news agency reported on Thursday that the rover was awake and was able to pick up signals, although it still had a mechanical malfunction. "At first we were worried the rover could not withstand the low temperatures on the moon, because it entered its dormant state while in an abnormal state. But it is alive," Pei Zhaoyu, a spokesman for the lunar probe programme, said in comments quoted by Xinhua news agency. "It is still alive, so there is a chance it could be saved," Mr Pei added. Radio amateurs also reported picking up downlink transmissions from the rover on Wednesday night, correspondents said. Experts are still trying to work out what caused the malfunction, Xinhua said. Some reports suggest the problems could have been caused by a build-up of sticky dust on the lunar surface. The malfunction emerged in late January, before the rover entered its scheduled dormancy period, Xinhua reported at the time. The rover had been scheduled to become dormant for 14 days during the lunar night, when there would be no sunlight to power its solar panel, reports said. There were concerns the six-wheeled vehicle did not power down properly and so would not be able to protect itself from the moon's frigid temperatures, the BBC's Celia Hatton in Beijing reports. Even if the Jade Rabbit's exploration is over, many in China see its original soft landing on the moon, and the first images it beamed back to Earth, as proof of its success, our correspondent adds. The rover is part of China's Chang'e-3 mission, which is designed to test new technologies, gather scientific data and build intellectual expertise. News of the rover's awakening generated massive discussion on Chinese social media, with the term "Jade Rabbit" becoming the most searched term on Sina Weibo, a Chinese microblogging platform. Users expressed happiness at the news the rover, which many called "the rabbit", was awake. "The little rabbit deliberately woke up today, so it can enjoy Valentine's Day and the Lantern Festival [on Friday]," user Big Belly Onion Knight Mars wrote.